The only way this joint would be any more holy is if it were made with actual pages from the Bible. Yeah, man, you didn’t know you could smoke Bible-pages? Yep, they’re usually made from rice or some other smoke-able paper. SO if you find yourself in a hotel room with some weed and no papers, check the nightstand droor…there should be hundreds of ’em. 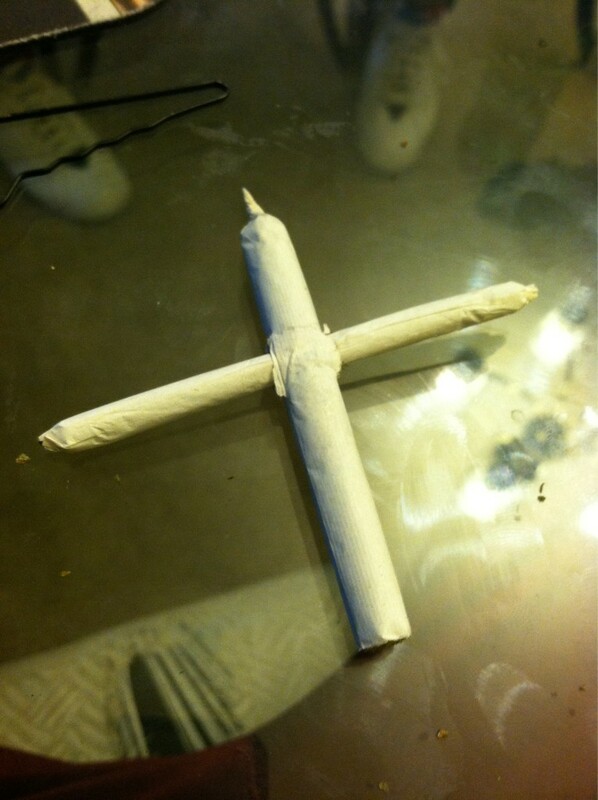 We hear the book of Revelations makes the best joints. Speaking of using pages out of a Bible to roll joints, did you ever hear the story about the poor STONER kid who’s mom turned him into the cops because he was using pages straight out of the gospel to smoke his weed? Maybe dude was absorbing all the teaching of the lord through osmosis or something? If it’s encouraged to drink blood in the form of red wine in some churches, what’s wrong with smokin’ a li’l sacramental herb wrapped in holy scripture? Look, we’re not trying to get all Beatles-like and say something’s more popular than Jesus, but according to the Family Feud when 100 people were asked the question “Name something that gets passed around” the most popular answer wasn’t “the collection plate”. Special Danks, @_omezzie_ for the pic.